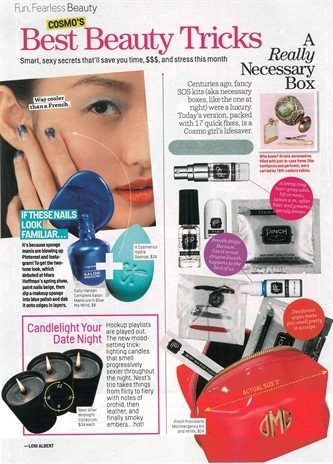 Cosmopolitan's Best Beauty Tricks for May 2013 features a sponge manicure for a fun two-tone look. The trend made its debut at Mara Hoffman's spring show and has become increasingly popular on Pinterest and Instagram. To achieve the look first paint nails beige, then dip a makeup sponge into blue polish and apply it to the edges in layers. The feature recommends Sally Hansen's Blue My Mind and It Cosmetics' Hydra Sponge. Cosmopolitan says the sponge mani is "way cooler than a French."